A new study has shown that children who experience parental imprisonment during their youth are more likely to die prematurely. Steve van de Weijer, co-author of the study and a postdoctoral researcher at the Netherlands Institute for the Study of Crime and Law Enforcement (NSCR), discusses the key findings and possible causes, and looks at policies that can reduce negative outcomes for children of imprisoned parents. As a consequence of the rising prison population worldwide, the number of children who experience the imprisonment of a parent has rapidly increased during the last couple of decades. Each year, millions of children in the world have a parent in prison. It is probably not surprising to most people that these children do poorly compared to other children, in various domains. Scientific studies have, for example, shown that these children are more likely to engage in antisocial, violent and criminal behaviour and to be imprisoned themselves. Drug abuse, physical and mental health problems, school failure, and teenage pregnancy have also been shown to occur more often among the group of children who experience parental imprisonment. Because of these poor outcomes, these children have also been called ‘orphans of justice’ and the ‘unseen victims of the prison boom’ by various scholars. A new study, which I conducted with Holly Smallbone (Griffith University/NSCR) and Valery Bouwman (NSCR), shows that children who experienced parental imprisonment during their youth are also more likely to die prematurely. Over the past couple of years, several studies have already shown that parental imprisonment is linked to higher mortality rates among infants in the USA and Australia and among male teenagers from Denmark. Our study, on the other hand, focused on more long-term consequences of parental imprisonment by looking at mortality in adulthood, until the age of 65. We compared three groups of individuals from a large number of high-risk families from the Netherlands: 116 children who had experienced parental imprisonment between ages 0 and 18; 300 children who had a parent who was convicted during their youth but not sent to prison; and 825 children who did not experience any parental conviction during their youth. These children were, on average, born in 1960, and they were all followed over their life course, until December 2007. In total, 3.7 per cent of these individuals died before December 2007. This is considerably higher than the mortality rate among all Dutch individuals born in 1960 – only 2.4 per cent had died in this period – which indicates that the families in our study were at an increased risk of dying prematurely. A comparison between the three groups in our sample further showed a clear link between parental imprisonment and mortality risk. Among those who experienced parental imprisonment during their youth, 6.9 per cent was deceased. This is considerably higher than the mortality rate among those with non-criminal parents (3.2 per cent). More interestingly, children of imprisoned parents (6.9 per cent) were also more likely to die than those with criminal parents (4 per cent), even after taking into account differences in types and frequency of criminal behaviour. This illustrates that it is not just parental crime that increases the mortality risk, but that it is specifically related to the imprisonment of the parent. Children of imprisoned parents (6.9 per cent) were also more likely to die than those with criminal parents (4 per cent), even after taking into account differences in types and frequency of criminal behaviour. This large difference in mortality risk between children of imprisoned parents and children of criminal parents surprised me for several reasons. Firstly, the prison sentences of the parents in our study were relatively short: about half of the children experienced parental imprisonment for a period shorter than a month. Secondly, prison conditions in the Netherlands are considered to be relatively humane compared to many other countries, including the United States. And thirdly, the Netherlands has a particularly egalitarian society with an extensive social security system. All Dutch citizens have mandatory health insurance and medical help, and medicines are available to everyone, at a relatively low cost. In addition, supplementary income support is provided for those who lose their job or are not able to work due to physical problems. The fact that children of imprisoned parents have such high mortality rates even under these relatively good circumstances shows how vulnerable this group of children is. But do these results also mean that parental imprisonment causes offspring mortality? Maybe, but we don’t know for sure. There are several possible explanations for this link between parental imprisonment and offspring mortality. Parental imprisonment can be a very stressful event in the life of young children. The trauma caused by this stressful experience can lead to physical and mental health problems and, possibly, eventually to a larger risk to die at a young age. Moreover, parental imprisonment often worsens the financial situation within these families. The parent cannot work and earn money while imprisoned and might have problems finding a new job after release. In addition, legal costs have to be met, and keeping in touch with the imprisoned parent can also be very expensive. Due to this financial strain, these families may have less resources to get the medical help and medicines that they need. Finally, it is also possible that the higher mortality risk of these children is not caused by the imprisonment of their parents, but rather children from these families already had an increased risk of dying at a young age regardless of their parent’s imprisonment. This could be a consequence of the adverse environments in which these families might live, which increase the risk for both imprisonment and early death, while genetic factors can also contribute to adverse outcomes for both parents and children. In our study, for example, alcohol abuse may have played a role. In the 1960s and 1970s – the decades in which most parents in our study were imprisoned – many prisoners in the Netherlands were convicted for driving under the influence. As alcohol abuse clusters within families, their children may have suffered from alcohol-related diseases and deaths. In these cases, children’s mortality is not caused by parental imprisonment, but the imprisonment and early mortality are both consequences of alcohol-related problems within the family. It is clear that children of prisoners need more attention and help. More research is necessary to understand which of these (or other) mechanisms best explain our findings. Nevertheless, it is clear that children of prisoners need more attention and help, as our study adds to the growing amount of research that shows poor outcomes for these children. 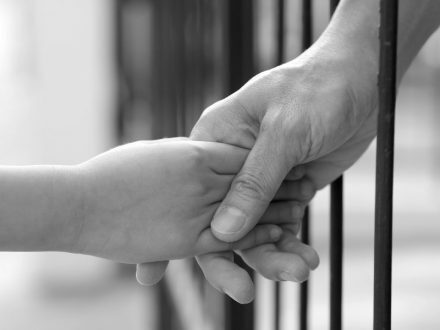 Earlier this year, Sara Wakefield and Christopher Wildeman wrote a policy brief for the National Council on Family Relations, in which they suggest a number of policies to reduce these negative outcomes for children of imprisoned parents. Such policies could already be implemented at the time of arrest of the parent, by training police officers to think of the safety and well-being of the children during their parent’s arrest. It should be ensured that these children have a safe and stable place to stay and are being informed about what is happening to their parent, in order to minimise the instability that these children experience. Other suggestions for policies mentioned by Wakefield and Wildeman include exploring alternatives to incarceration for primary caregivers and, if that is not possible, prioritising family connections while incarcerated. This last policy could benefit both child and parent, as studies have also shown that prisoners who are connected to their family are less likely to recidivate. An example of this is a pilot, which is due to start soon at a prison in the Dutch city of Leeuwarden, which will offer a special wing for fathers. Prisoners in this wing can meet their children – without camera surveillance – in a special family room, where they will have toys to play with. Moreover, they will be able to talk to their children at home using Skype. Hopefully, more initiatives like these will follow and will be evaluated so that policies for imprisoned parents can be further developed, in order that children in the future will be less affected by the negative consequences of the crimes of their parents. The 2010 UN Rules on the Treatment of Women Prisoners and Non-Custodial Sanctions for Women Offenders (the ‘Bangkok Rules’) provide some safeguards for children of imprisoned parents. While the Rules are designed for women offenders, their preliminary observations state that some Rules, including those relating to parental responsibilities, equally apply to offenders who are fathers. The Rules stipulate that non-custodial alternatives to custody should be applied wherever possible if someone facing imprisonment has sole caring responsibilities, and children must be taken into account at all stages of a parent’s contact with the criminal justice system. Read PRI’s short guide to the Bangkok Rules here. Steve van de Weijer is a criminologist and a postdoctoral researcher at the Netherlands Institute for the Study of Crime and Law Enforcement (NSCR). His research focuses on the life course of criminals, with a specific focus on the inter-generational consequences of crime and imprisonment. A short briefing considering the standards in place to protect children whose parents are in conflict with the law and how to implement them effectively.